Amanda Faber uses pimento and carnitas in her "Pies and Tarts Week" Showstopper bake. 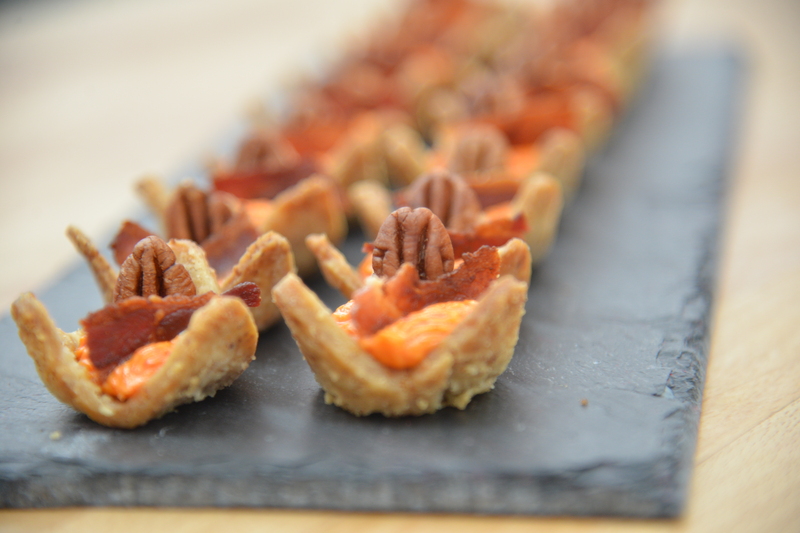 She makes her Pimento Tarts recipe with a pecan crust as pimento is one of her favorite southern staples. 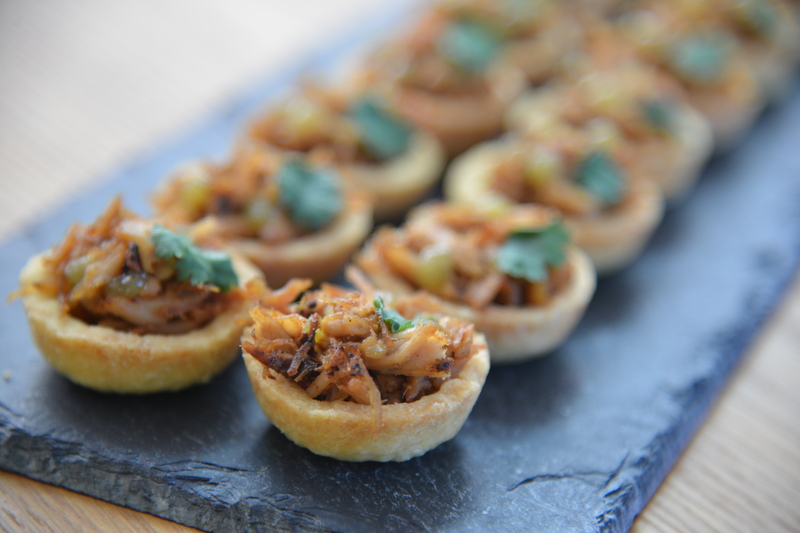 Her Carnitas Tartlet recipe features a spicy meat in a cornmeal crust. Judge Mary Berry finds Amanda's Pimento "divine." Watch the full episode of "Pies and Tarts Week" from Season 2 Episode 4 of The Great American Baking Show to find out is Amanda's Hor D'Oeuvres keep her in the tent. 1. In a food processor, process pecans until they are finely ground. 2. In a large mixing bowl, combine pecans, flour, sugar, and salt. Mix with pastry cutter to combine. 3. Cut in cubed butter with the pastry cutter until the butter is in small pieces. Put mixture in refrigerator. 4. In a small bowl, whisk to combine the egg and water. 5. Pour the egg and water mixture over the flour mixture. Stir with a fork to combine. 6. Use one hand to create dough. 7. Turn dough out on to a piece of plastic wrap. Cover with another piece of plastic. 8. Roll until about 1/4inch thick. Slide on to a jellyroll pan. Chill in refrigerator. 9. Once it is cool, about 20 minutes, use a cutter to cut at least 18 triangles. 10. Spray a mini-muffin pan with non-stick spray. Place a triangle in to each cup. Freeze. 11. Once frozen, bake in a 425° F oven for 6-10 minutes. Cover with foil if browning too quickly. 12. Cool completely and fill with pimiento cheese. 1. In a large mixing bowl, combine cornmeal, flour, sugar, and salt. Mix with pastry cutter to combine. 2. Cut in cubed butter with the pastry cutter until the butter is in small pieces. Put mixture in refrigerator. 3. In a small bowl, whisk to combine the egg and water. 4. Pour the egg and water mixture over the flour mixture. Stir with a fork to combine. 5. Use one hand to create a dough. 6. Turn dough out on to a piece of plastic wrap. Cover with another piece of plastic. 7. Roll until about 1/4inch thick. Slide on to a jellyroll pan. Chill in refrigerator. 8. Once it is cool, about 20 minutes, use a cutter to cut at least 18 circles. 9. Place a circle in to each cup of a mini muffin pan. Use the rolling pin to shape, if needed. Freeze. 10. Once frozen, bake in a 425° F oven for 6-10 minutes. Cover with foil if browning too quickly. 11. Cool until they are able to be handled, a couple of minutes, and fill with carnitas. 1. On a cutting board with a sharp chef's knife, cut the pork in to 1-2 inch pieces. 2. In a large cast iron Dutch oven, combine the pork, orange juice, lime juice, garlic, cumin, and salt. Add enough water so that the pork is completely covered. 3. Bring to a boil, reduce heat to a simmer. 4. Simmer without stirring for about 30 minutes. 5. Then, turn the heat up to medium-high and turn the meat occasionally until the water has evaporated. 6. Brown the pork in the rendered fat. 7. Once browned, remove from heat, shred the meat using two forks. 8. Cover to keep warm until time to serve. 1. First make the mayonnaise. Combine the egg, Dijon mustard, salt, and lemon juice in the food processor. 2. While running, add in the oil in a slow and steady stream. Keep running on high until thickened and creamy. 3. Remove the mayonnaise in to a bowl. Return 100g of mayonnaise to the food processor. 4. Combine all of the remaining ingredients in a food processor. 6. Chill until ready to use. 7. Put pimiento cheese in to a piping bag fitted with a star tip. 1. Roughly chop the bell pepper and jalapeño. Remove seeds and membranes. 2. Put the bell pepper, jalapeño, apple cider vinegar, sugar, and water in to a food processor. Blend until smooth. 3. Cook the pureed mixture in a sauté pan until it boils, then simmer for 10 minutes. 4. Meanwhile, combine the corn starch and water in a small bowl. 5. After simmering, add the corn starch mixture and cook for about 5 minutes more. 6. When the desired thickness is reached, transfer the pepper jelly to a bowl to cool. 7. Once cool enough, but still warm, put the jelly in to a freezer bag. 8. Just before serving, pipe a dollop of jelly on the top of each carnitas tart. 1. Cook the strips of bacon oven a medium-low heat. 2. Turn occasionally until crispy. 3. Cool on a plate covered with a paper towel. 4. Top each of the pimiento cheese tarts with a small piece. 1. Cut the pecan halves in half. 2. Put the pecans in a single layer on a jelly roll pan. 3. Toast for 8 minutes in a 350° F oven, turning occasionally.